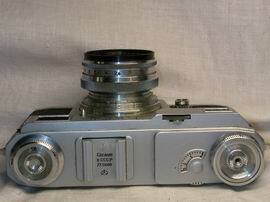 The Kiev 4A is a Soviet-era Contax camera made by the Arsenal factory located (where else) by the city of Kiev. After the end of WWII, the Russians seized the Zeiss factories as part of the war reparations. They took the tools, dies, left over parts, and a bunch of engineers and transplanted them to Kiev. The Kiev Camera emerged out of that. So rather than being a "Contax clone" they are real Contax cameras made with real Contax parts, equipment, technicians, and schematics. As years passed, the Soviets added further "improvements" (mostly to simplify production), but to a large degree you can interchange Kiev parts into Contax I & II cameras for repair. After the War, Zeiss in West Germany did not have the equipment or dies to make new Contax II rangefinders since they were taken by the Russians, so working from scratch they came up with a totally new design in the Contax IIa which is smaller than the II series. Parts and technology are not interchangeable between the Contax II and IIa or Kiev 4 and Contax IIa. When identifying Kiev cameras, the 'a' after the model number indicates that the camera does not have a light meter. While the meter was extraordinarily innovative when introduced into the Contax system in the 1940s, to contemporary eyes it just looks like an ugly bulbous growth. Thus, the no-meter Contax and Kievs are becoming more popular nowadays because of their sleeker lines. I ended up selling my Kiev at a swap meet. I have a Nikon S2 which is a much better clone of the Contax and I never used the Kiev much in practice. Because they are direct descendants of Contax cameras, Kievs are totally compatible with Zeiss / Contax rangefinder bayonet lenses. However... for their rangefinders, Nikon took Contax's bayonet mount and change the cam ratio a bit, so while Nikon rangefinder lenses will mount on a Contax/Kiev (and vice versa), you should be aware that there will be slight focusing inaccuracies with normal to long lenses (50mm~135mm) at full aperture. Also, while Nikon decided to use the simpler and more durable horizontal cloth curtain of the Leicas; as a pure Contax descendant the Kievs use the complex vertical-travelling metal slats of their German forbears. The "curtains" use the same principle as the sliding tambours in a old wooden writing desk. While ... ingenious ... this is really not an ideal system. The metal slats have a lot of inertial mass which means most Kiev/Contax's max speed of 1/1000 sec is really wishful thinking (most of the time, the 1/1000 speed will give you about 1/800 sec). The Contax/Kiev slats are more expensive to repair than the cloth curtains of the Leica and their Soviet clones, the FEDs and Zorkis. One last difference between the Nikon rangefinders and the Kiev/Contax is that Nikon reversed the direction of the body focusing dial. With the Nikon, you pull on the dial to focus the lens from infinity closer. This is a very natural movement. With the Kiev/Contax, you push the dial to move the lens out of infinity to closer objects. This causes a bit more wear and tear on the fingertips. Don't adjust the shutter speed without first winding the camera! When changing to a slower shutter speed, rotate counter-clockwise. This will energize the slow-shutter speed mechanism (you'll feel it when you move from 1/60 to 1/15 and slower). For B and 1/30 sec (which is the unmarked X-sync speed), rotate clockwise. To the left of the lever is the film counter and further left, is the film speed/type reminder (marked in Soviet GOST units). The accessory shoe is "cold" but there's a PC sync connection for X electronic flashes on the front left of the camera. 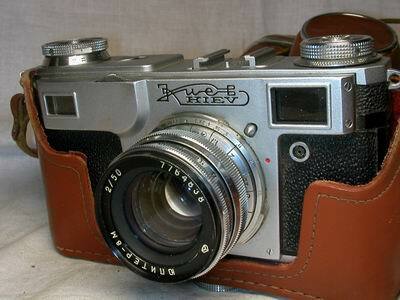 The Kiev normally comes with a Jupiter-8M 52mm f/2.0 lens. This is the same as the LSM Jupiter-8. I've been extremely pleased with my Leica-mount Jupiter-8 series lenses, they deliver crisp sharpness and pleasant color renditioning. One web page suggests that the 8M reduced the number of lens elements to 5, retaining the same 3 group configurtation (Sonnar-clone). With a good lens shade (hood) they are unbeatable. Note that the Nikon 50mm f/1.4 is also a 5 element / 3 group lens, so there's nothing inherently bad about the reduction. I also bought the Jupiter-12M 35mm f/2.8 lens for my Kiev. It also uses the same design as the LSM version (which I've found to be simply excellent). I'm looking forward to using the 12M on my Nikon S2 as well. It's easy to knock rangefinder cameras like the Kiev out of horizontal or vertical RF calibration with small knocks or jars. This is fairly common on older (and even newer) rangefinders. Unfortunately, Kiev/Contax didn't provide for a way to adjust both horizontal and vertical RF calibration without opening the camera up, so some minor surgery is required. 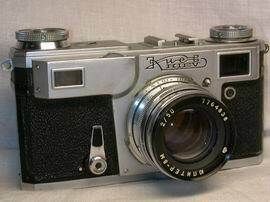 The Kiev rangefinder is almost as easy to adjust as the Fed ! First you have to carefully remove the chrome front cover. Take off the lens. There are screws on each side at the top as well as two at the bottom of the front cover. Once you remove the top, then you can see all the working parts. You then have to remove a little of the covering to the left side of lens mount (there is one more screw under it). it there are two small screw, set lens to infinity, then loosen the screws a little and you can move the glass part left or right, check in the viewfinder until a distant object is in alignment, then tighten the two screws, check again before replacing the front cover and it should be ok! Note: This operation has the possibility of fouling your camera if you have the wrong size screwdrivers or slip while the driver is inside the camera. Please use reasonable and appropriate caution when thinking about doing this. I don't have information on how to do the vertical calibration (if it is possible at all). Help and suggestions are appreciated! Viewfinder shows 50mm frame of view. Zilch eye relief. 1/2, 1/5, 1/10, 1/25, 1/50, 1/125, 1/250, 1/500, 1/1000 of a second and "B". 1.00 x magnification factor. 90mm effective baselength. 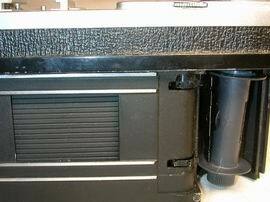 *After 1959, a titanium shutter was used. Body:150mm x 79mm x 45mm, 560g Body: xxxxxxxx mm, xxg Body: xxxxxxxx mm, xxg Body: 138mm x 77mm x 36mm; 595g. 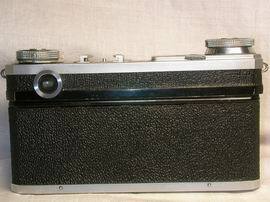 Zeiss Historica: "After Dresden: the migration of the Contax to Jena and Kiev"
Copyright © 2002-04 by Karen Nakamura. All rights reserved. This page and its images may not be reduplicated in any form. I have been actively policing eBay, MercadoLibre, and other auction sites and have had several people's accounts and auctions kicked off their systems for plagiarizing content from this site. Please do not jeopardize your feedback ratings by engaging in copyright violations, it is a violation of Federal and International Copyright laws as well as your ebay Terms of Service. Last modified: Wednesday, 29-Dec-2004 01:28:26 EST , [an error occurred while processing this directive] .